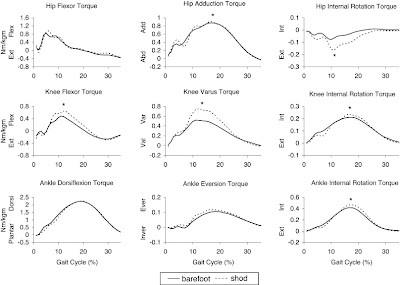 Joking aside, while the study demonstrates that shoes cause higher stresses in various joints, that doesn't necessarily mean barefoot running is beneficial. The risks of shod running must be weighed against the risks of barefoot running. The marginal benefits of barefoot running may not be as large as other methods of reducing the risk of osteoarthritis. Changing the runner's form, choice of shoe, or (especially) the runner's weight may all be more effective. My son makes some good points. Just may have to give it a try come summer, since I'm not interested in testing COLD barefoot running as my starting point. If you step in something squishy when running barefoot, do you run faster, or stop and take a look? It depends on how warm the something squishy is.